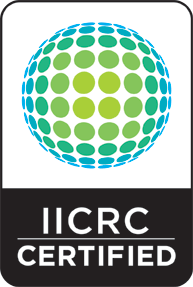 All Pro Restoration is an IICRC Certified Firm. This certification requires that we adhere to the restoration standards. As a disaster restoration company, we are required to adhere to restoration standards that include the following. Any restoration company that does insurance work is required to follow the exact same restoration standards for drying. This standard is called the ANSI/IICRC S500-2006 Standard for Professional Disaster Restoration. It “is a procedural standard. It is based on reliable restoration principles, research and practical experience.” (IICRC.org) We carry a copy of the S500 on each disaster vehicle. If a restoration company does not follow these procedures, they are putting the homeowner at risk by not properly handling the disaster. Every restoration company should be using an restoration standard price list called Xactimate. Xactimate is a software that was developed for the insurance industry so that price standardization could be established in the restoration category. If a company is not using Xactimate for their pricing, their services may not be paid for by your insurance company. Every technician should be Institute of Inspection, Cleaning & Restoration Certification (IICRC), Water Restoration Technician (WRT) certified, or working on the project with an IICRC, WRT certified technician. In addition to the restoration standards above, as a restoration company that also performs mold remediation services, we are required to adhere to the BSR-IICRC/S520-2008 Standard and Reference Guide for Mold Remediation. “The IICRC S520 is based on reliable remediation and restoration principles, research and practical experience, and attempts to combine essential academic principles with practical elements of restoration for technicians facing “real-life” mold remediation challenges.” (IICRC.org) The standards in this document ensure the safety of you and your family during the mold remediation process. If every restoration company has to follow these restoration standards, then what makes them different? Read “The All Pro Difference“.